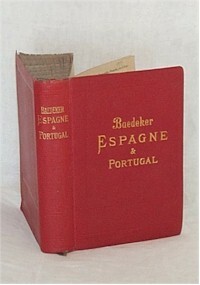 These are all the Baedekers on Spain and Portugal, although parts of the countries and places such as the Canary Islands and Madeira were covered in books on this page, especially in the editions on the Mediterranean (German and English only). It was only quite late that the Iberian peninsula attracted Baedeker's attention. Of course, tourism wasn't a big deal in Spain and Portugal in those days - charter air traffic not having been invented. The railways were not very good and it was, in general, not a very fashionable place to go. Today, however, the books are quite sought after and often reach higher prices than other series of equivalent age.